Kirkpatrick was born on 3 February 1897 in Wellington, India, the elder son of Colonel Ivone Kirkpatrick(1860–1936) of the South Staffordshire Regiment, and his wife, Mary (d. 1931), daughter of General Sir Arthur Edward Hardinge, later Commander-in-Chief, Bombay army, and Governor of Gibraltar. His father was a descendant of a Scottish family which settled in Ireland during the eighteenth century. His mother was former maid of honour to Queen Victoria, and her grandfather Henry Hardinge, first Viscount Hardinge of Lahore, served in the cabinets of Wellington and Peel, and was later governor-general of India in 1844–8. Her first cousin, Charles Hardinge, Baron Hardinge of Penshurst, was Permanent Under-Secretary of the Foreign Office in 1906–10 and 1916–20, and Viceroy of India in 1910–16. Being a Roman Catholic, Kirkpatrick was sent to Downside School to be educated between 1907 and 1914. Kirkpatrick volunteered for active service on the outbreak of the First World War and was commissioned in November 1914 in the Royal Inniskilling Fusiliers. Severely wounded in action against the Turks in August 1915, he was accepted by Balliol College, Oxford, in October, but chose to resume his war service early in 1916 when he was employed in propaganda and intelligence activities for the GHQ intelligence service Wallinger London. During the last year of the war he was stationed in Rotterdam in the Netherlands as replacement for Sigismund Payne Best. From there he worked as a spy master, running a network of Belgian resistance agents operating in German-occupied Belgium. He entered the diplomatic service in July 1919. He was firstly posted to Brazil for one year, returning to London in August 1920 to take up a post in the Western Department of the Foreign Office. He was promoted second secretary in December 1920 and first secretary in October 1928. On 10 January 1929 he married Violet Caulfield, daughter of Colonel Reginald James Cope Cottell, army surgeon, of 7 Phillimore Terrace, London; they had one son, Ivone Peter (1930-2013), and one daughter, Cecilia Sybil (1932-Unknown). Kirkpatrick was then posted to the British Embassy at Rome from 1930 to 1932; chargé d'affaires at the Vatican in 1932-33; and first secretary at the British Embassy at Berlin from 1933 to 1938. It was during this time that he got firsthand experience of dealing with the emerging European dictatorships. During the Second World War Kirkpatrick was once again employed in the propaganda and information work which he had so relished twenty-five years earlier. Appointed Director of the Foreign Division of the Ministry of Information in April 1940, he became Controller of the European services of the BBC in October 1941. During this time, he made a major contribution which included the task of interviewing Hitler's deputy, Rudolf Hess, following Hess's flight to Scotland in May 1941. His report on Hess was shown only to the Prime Minister, Winston Churchill, Foreign Secretary Anthony Eden, Lord Privy Seal Clement Attlee and Minister of Aircraft Production Lord Beaverbrook. In September 1944 Kirkpatrick was appointed to organize the British element of the Allied Control Commission for Germany, and following the end of the war he served at Supreme Allied Headquarters as British political adviser to U.S. General Dwight D. Eisenhower until that organization's disbandment. After the war, he became Permanent Under-Secretary for the German Section at the Foreign Office in 1949. In June 1950, Kirkpatrick was appointed by King George VI as British High Commissioner for Germany. 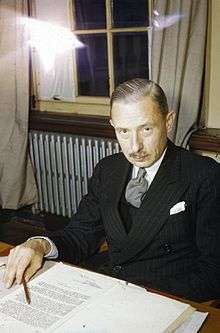 As one of the three joint sovereigns of western Germany, Kirkpatrick carried immense responsibility particularly with respect to the negotiation of the Bonn conventions during 1951–2, which terminated the occupation regime and (in parallel) prepared the way for the rearmament of West Germany. In November 1953, Kirkpatrick was brought back to London to succeed Sir William Strang as Permanent Under-Secretary. Kirkpatrick was related to a former PUS, his mother being first cousin to Charles Hardinge. He joined the Office in February 1919 after spending the previous three years in wartime intelligence and propaganda work, an activity to which he returned when in 1941 he became foreign adviser to the BBC. Serving as head of Chancery in Berlin during 1933–38, he made clear his detestation of the Nazis. His views seem not, however, to have made any great impression on the British Ambassador, Sir Neville Henderson. After 1945 he was again very much involved with German affairs, serving for a year in the Office's Germany Section and then, during 1950-53, as High Commissioner in Bonn. Kirkpatrick had a reputation as a combative, even aggressive, Irishman, who had little time for discussion. He was not, according to some of his former colleagues, the easiest of men to work with, and in Lord Gladwyn's opinion he would have made 'an excellent general'. 'No country [in the Western world] can any longer pursue an independent foreign policy. The liberty of action of each is in varying degrees restricted by the need to obtain the concurrence of one or more members of the alliance'. If we sit back while Nasser consolidates his position and gradually acquires control of the oil-bearing countries, he can and is, according to our information, resolved to wreck us. If Middle Eastern oil is denied to us for a year or two, our gold reserves will disappear. If our gold reserves disappear, the sterling area disintegrates. If the sterling area disintegrates and we have no reserves, we shall not be able to maintain a force in Germany, or indeed, anywhere else. I doubt whether we shall be able to pay for the bare minimum necessary for our defence. And a country that cannot provide for its defence is finished. Sir Evelyn Shuckburgh said of Kirkpatrick: "He was so sharp that he cut". However, Suez sullied Kirkpatrick's reputation as PUS, though he may have been guilty of no more than fulfilling a civil servant's duty of loyalty to his political chiefs..
After retiring from the Foreign Office in February 1957 Kirkpatrick served for five years as chairman of the Independent Television Authority. In addition to his memoirs he wrote Mussolini: Study of a Demagogue (published posthumously in 1964). He was appointed Companion of the Order of St Michael and St George (CMG) in 1939, Knight Commander (KCMG) in 1948, Knight Commander of the Order of the Bath (KCB) in 1951, Knight Grand Cross of the Order of St Michael and St George (GCMG) in 1953, and Knight Grand Cross of the Order of the Bath (GCB) in 1956. He died at his home, Donacomper, Celbridge, co. Kildare, Ireland, on 25 May 1964. He was survived by his wife and two children. ↑ Keith Kyle Suez: Britain's End of Empire in the Middle East (I. B. Tauris, 2003), pp. 225-6. The Inner Circle: The Memoirs of Ivone Kirkpatrick (London: Macmillan, 1959). Mussolini: Study of a Demagogue (London: Odhams, 1964).